Mark Obert-Thorn has done his usual excellent job remastering these monaural originals. True, the first thing we hear, the thudding tympani roll at the start of the Bruch, doesn’t sound especially like tympani, or like anything else musical; that particular sound never improves. But the wind chords that follow are surprisingly clear; the solo violin, front and center, startlingly so. Even the turbulent tutti at 5:04, while a bit grainy, comes across reasonably. Only the score’s final full-orchestra passages suffer noticeable, though mild, distortion. The Elgar, recorded less than a year later, is even better. Menuhin’s violin again registers clearly, if without the breathtaking ‘placement’ of the Bruch. Behind him, the violins sound powdery whenever they ascend into the topmost range, as do the brass punctuations; once the ear adjusts to these mild flaws, the orchestral reproduction is better than listenable. 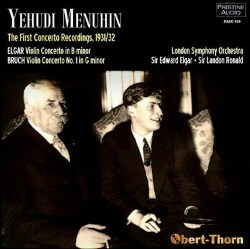 I’d somehow managed to miss Menuhin’s famous Elgar recording in its various earlier CD issues, not to speak of vinyl. The sixteen-year-old violinist learned the piece especially for the sessions – after producer Fred Gaisberg couldn’t persuade Fritz Kreisler, the soloist at the 1910 premiere, to record it – yet produced an astonishingly mature interpretation, particularly in the first movement. He introduces the first theme reflectively, and continues in a ruminative, searching vein through the second, bringing a lovely improvisatory spontaneity to many of the quiet passages. Near the end of the movement, he propels the high filigree with deft delicacy. On the down side, Menuhin’s technique, while accomplished, evinces the inconsistent tone and sketchy intonation that would gradually become more pervasive. Some of the first movement’s wide leaps don’t land quite accurately; the triplets at 11:56 of that movement, and the double-stops and high trills in both the Allegro molto and the Cadenza, are spotty. In the fast passagework, the notes all ‘speak’, but don’t all hit dead center of the pitch; neither do they in the first movement. The violinist’s artistry remains undeniable, to be sure, so there are compensations: if, in the Andante, the high cadence at 2:07 lands distinctly flat, he’s ardent in the low range, and the extended high phrases later on are breathtaking; and the whirling close of the piece, despite the hit-or-miss tuning, is fetching. Elgar’s own podium leadership is worth discussing, particularly since ‘tradition’ in this music seems to have evolved away from his style. The composer launches the orchestral introduction in a no-nonsense manner, emphasizing the music’s surge and its broad, arching lines where others favour spaciousness. The clarinet phrases the second theme movingly, and the arrival of the climax at 9:08 is, again, forthright. In the flowing, pleasingly lyrical Andante, the musical shapes come across more clearly than in broader, more conventional performances. Finally, Elgar’s unfussy treatment of the Allegro molto helps unify what can seem a very random series of diverse episodes. The Elgar recording is the more famous of these two, but the Bruch, from a year earlier, is equally significant, as the fifteen-year-old virtuoso’s first concerto recording. Menuhin plays the first movement with mostly pure, vibrant tone and taut rhythmic address, along with (again) some flawed intonation. On the other hand, he belabours the second theme – as if feeling the need to prove something – with the sort of rubato that just weighs down the line. He ‘sings’ the great theme of the Adagio fervently, again with some laboured rubato, and brings a lovely uplift to the Finale. The orchestra under Sir Landon Ronald plays adroitly, seconding Menuhin’s intense expressiveness in the Adagio; at 5:08, the violin figures are allowed to dominate the orchestra’s melody, but this is true in most performances. If you're a devotee of Menuhin or of Elgar, you will want this.